This website celebrates more than 20 years of clogging history. Thousands of students have passed through the ranks of cloggdom perfroming classics such as Get Me Back to Dixie, The Irish, and (not to be forgotten) Grand Old Flag all over the world. Quite frankly, we miss clogging, the trips, the dances, the memories, but most of all- we miss you! We hope you will take some time to reconnect as we post decades of photos, vintage routine videos, and AAC facts. We also hope and STRONGLY suggest that you send us a BIO so we can see where everyone ended up and remember their clogging history. Please pass the word along so every clogger has the chance to find this site and indulge in a few giggles. We promise to update new footage, photos, and facts. Oh the sequins, oh the ending poses, and the memories all start here! It's TIME to CLOG 2013! 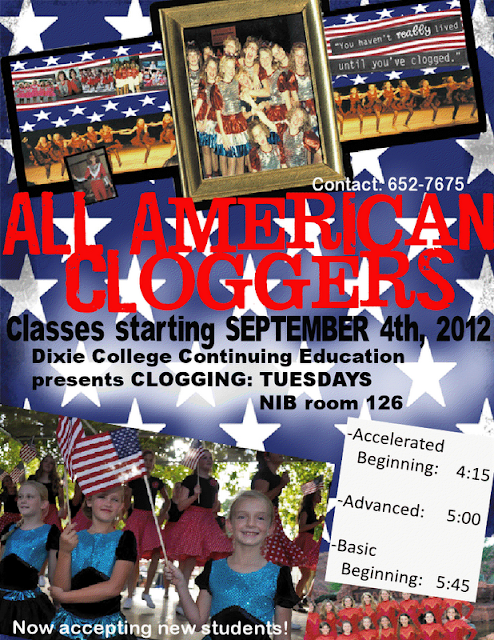 We are looking forward to another fun year of clogging by adding a new beginning class at 5:45 on Tuesdays. Spread the word and we will see you at our first performance of the season, Peach Days! The All American Cloggers officially began in 1984 under the direction of Cindy Metcalf and Polly Stirland. For nearly 30 years, they have combined the rhythms of tap, clogging and Irish dance to entertain audience all over the world. The AAC has performed internationally in Germany, Cancun, Japan, and at the Calgary Stampede in Canada. They have also danced at the Polynesian Cultural Center in Hawaii and as part of the 25th anniversary celebration of Disney World. Current cloggers performed at Disneyland this year and competed receiving several first placed trophies and an overall award. They hope to qualify again for Western Nationals at Lagoon this spring. 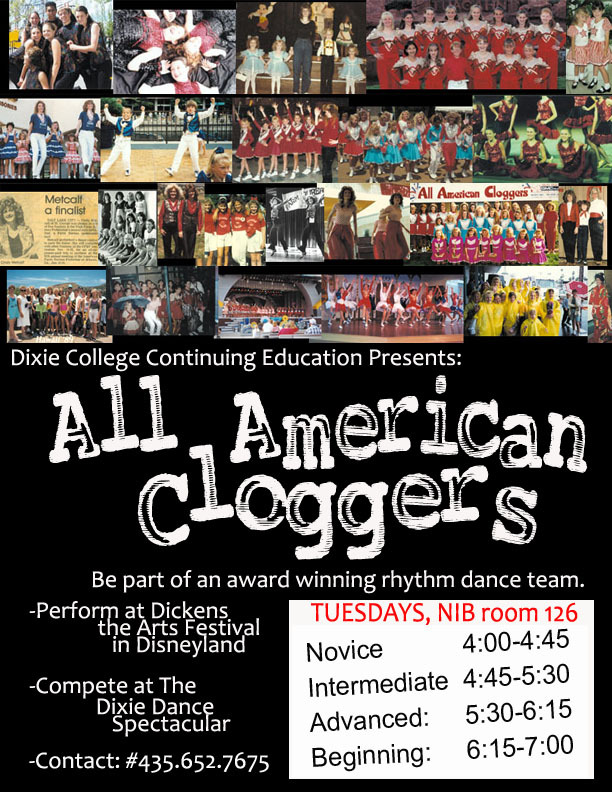 Under the direction of Nicole Metcalf Hadley, the All American Cloggers are currently accepting new students and are excited to share their passion of traditional rhythm dance with you. ***CONTACT NICOLE with any question. Practice the SINGLE and FANCY DOUBLE. What a terrific time to clog! We are beginning our new season and hope to see you in class. We performed at Peach Days in Hurricane. Here are some photos from our May 2011 recital. The alumni team took 1st in championship with a killer precision dance. Both Hurricane teams took 1st place. St. George earned a 1st and 2nd place competing their last year in intermediate. Post the AAC button on your site! Please help us spread the word. Copy and paste the following code on your blog so we can find AAC alumni! Really, no blog is complete without an AAC button right? Pretty please send us a brief note about where you are now so we can post it to our bio section!!! We would ABSOLUTELY LOVE to hear from every single All American Clogger that ever learned a shuffle step (and even those that almost did). Stats: How long did you clog, what are you up to now? or just click on the CONTACT link above and we'll get you posted. Wouldn't that be cool if we found everyone?!?!? DO YOU LOVE TO CLOG?